Travel Korea with the VisitKorea app! 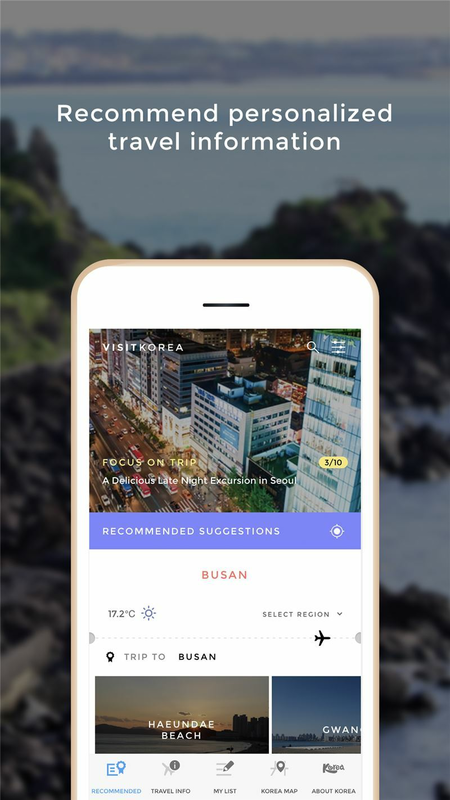 This travel app, created by the Korea Tourism Organization, offers information on Korea’s beautiful attractions, delicious foods, comfortable accommodations, exciting festivals, vibrant shopping centers, and more for an all-in-one resource to make your trip to Korea a success. Users can also use the map service for directions and public transit information, as well as get up-to-date exchange rates and emergency contact numbers for a safe trip. The Highlights and News sections of the app are updated weekly with special suggestions and information on new openings of attractions, restaurants, accommodations, shopping centers, and festivals. The About Korea menu has standard information in a variety of categories, including time differences, exchange rates, emergency contacts, operating hours of public businesses, tourist police and more. Whether you are in Seoul or Jeju, nearby recommended attractions are best. 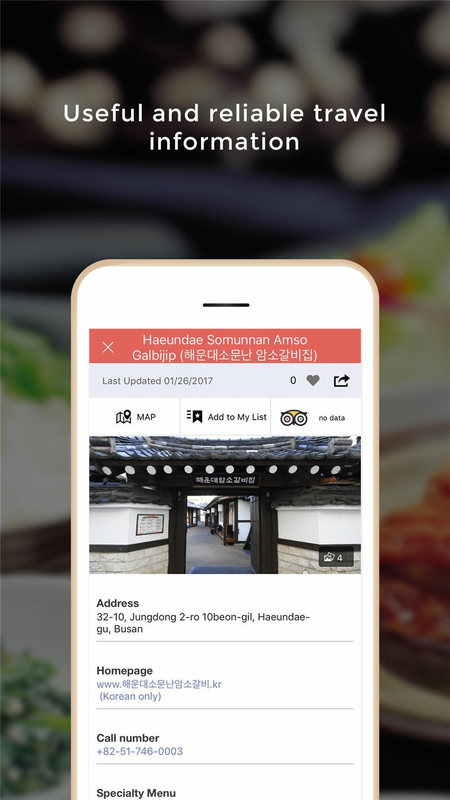 The VisitKorea app uses big data to find the attractions, restaurants, and accommodations that are best suited to your personality. (Personal information must be added to the settings in order to receive recommendations). No Internet connection? No problem! 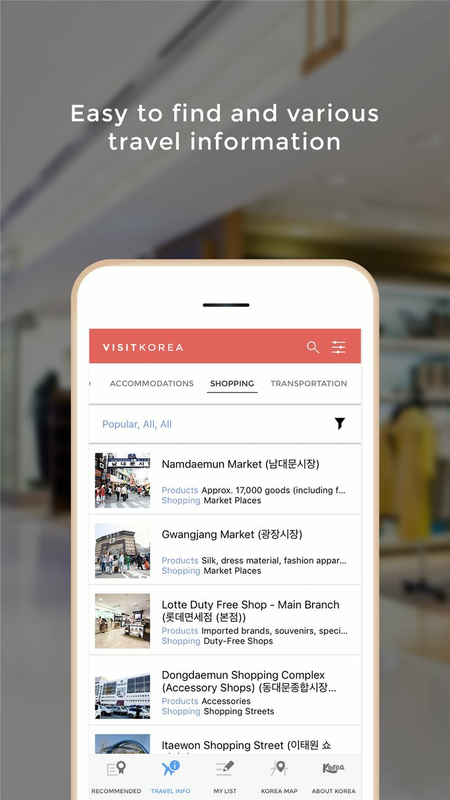 The VisitKorea app provides necessary and useful information even when not connected with the Internet.  Users can also save information such as Highlights, News, coupons, and detailed information in various categories directly to the app to be accessed at a later time when Internet is not available. If you are having trouble finding your way, use the map for directions from your current location to your destination! The directions can be searched using various modes of transportation, from public transit such as buses and subways to taxis and even walking. The map also has a function to view the complete subway lines in Seoul, Busan, Daegu, Gwangju, and Daejeon. 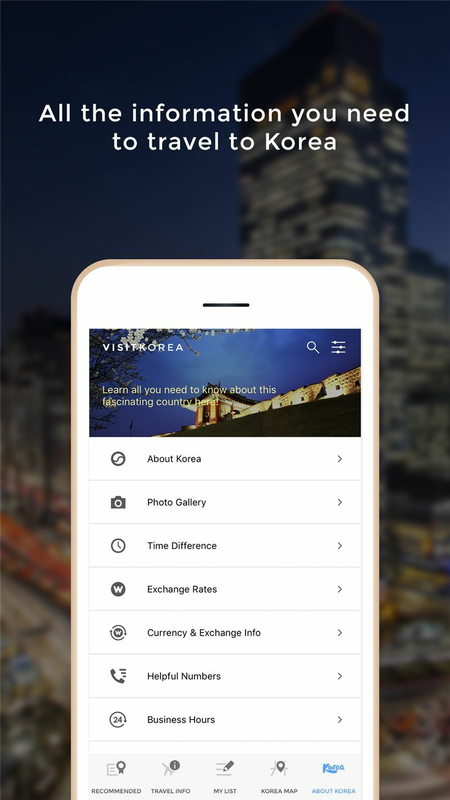 The VisitKorea app has information you can trust, provided by the Korea Tourism Organization. 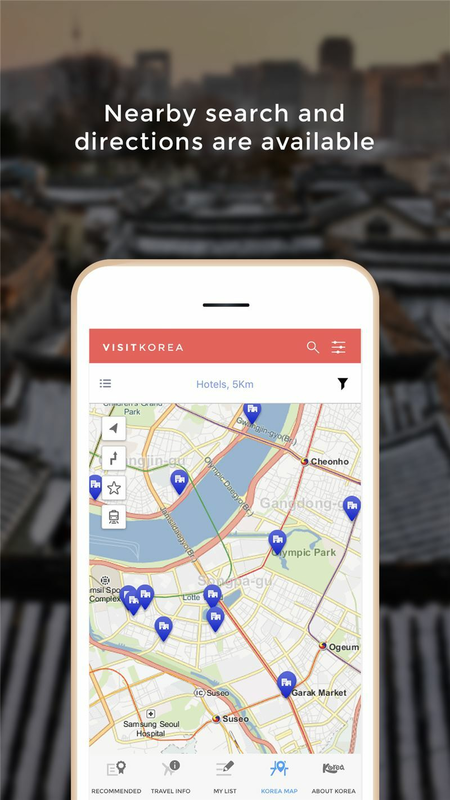 If you are planning a trip, are currently traveling in Korea, or just want to experience the country from the comfort of your home, the VisitKorea app is a must! The Korea Tourism Organization is working hard to provide the best service possible so you can have a happy time in Korea.